Metroid. Now a days the names Metroid, Samus Aran and Mother Brain are as familiar to gamers as Super Mario Bros, Mario and Bowser. The games playstayle created a style that would be enjoyed by fans of other series most notable the Castlevania series in the late 90's to mid 2000's. Its hard to belive that back in 1994 when Super Metroid was released many people still weren't familiar with Samus Aran. Sure we all heard the stories on the playground that Samus was the hero that if you beat the game quick enjoy would strip down to a bathing suit revealing what we all thought was a him to be a her. 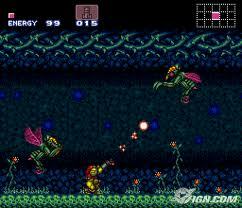 But for many Super Metroid was were alot of people begun their love of Samus. 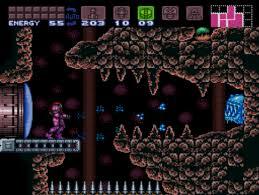 Released in 1994 Super Metroid was a direct sequel to the Gameboy game Metroid II: The Return of Samus. After completing her previous mission Samus is once again contacted for another mission. However before that mission can get under way Samus if forced into a battle with Ridley and soon given chase back to the planet Zebes where the game begins. Fans who played the first one will find themselves in familiar territory, but being that this is SNES will find the graphics and sounds alot better than their first trip to the planet Zebes. Also a welcome addition to the games is a map screen which means that unlike the first game we no longer have to break out the box of crayons and paper and draw our own maps. As said the graphics are a much improvement over the NES. Whether you are running through the jungles of Brinstar or swinging over the lava pits of Norfair each zone has its own unique colors and features giving you that sense that each zone is different. The music really adds to the atmosphere from the orchestrated theme of when Samus first lands on Zebes to the haunting selection of the Wrecked Ship, it really sounds like the music does belong in the zones. 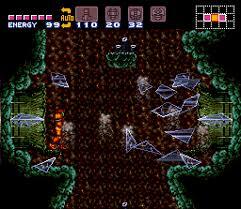 Speaking of Zones there are 5 huge zones in the game which as a staple of the Metroid series you will find backtracking through once you get certain utility weapons and items. Stuff ranging from a grapple beam, which allows you to latch on to certain blocks and some frozen enemies to get to there areas, to various suits which grants you the ability to take less damage from enemies. There are also energy tanks scattered around the zones which adds to your hit points pool and reserve tanks as well which you can use to refill your hit points kinda like etanks in the Mega Man series. As far as weapons go gone are the days of deciding do I want the wave beam or do I want the ice beam as now the beams "combine" which is a nice touch. As far as play control goes this is one of the weak points if this game has one would be. While for the most part Samus does move about well and will eventually move around alot better when you get items like the space jump and high jump boots but the problem I have is the wall jump. Now most gamers are use to a wall jump like Ryu from Ninja Gaiden or Mega Man X from Mega Man X series but Samus I found is just awkward. You have to actually time it just right or Samus wont do leading to what could be hours of frustration. The graphic that you need to spot in order to do the wall jump can be easy to miss since she only dones if for a split second and the controls are kinda hard especially if you are use to the mechanics of other games wall jump. But let me say that one good thing about the wall jump is its not really needed to get through this game. Sure people use it to speed run the game and to get to places that you can't get till later in the game but once you get the space jump ability you will find that you wont need to do the wall jump. As challenge goes I will admit this game can be a challenge but than again games during this age games were a bit harder it seems. Unfortunately there really aren't any clues as where to go in this game so who have to remember where you haven't been and what room had an obstacle that you couldn't get by before, but with the map it does make it a bit easier. Also luckily we live in the age of the internet so a walk through is only seconds away. The length of the games is how you want it to be most people can beat this game in a few hours however they usually pass up some energy tanks and maybe a missile upgrade or too but others can take 10 hours or more searching every nook and cranny of Zebes. The Wii U features are a nice addition. You have off tv play so if someone in your household needs to use the tv your adventure on the planet Zebes doesn't have to come to an end and of course there is the handy save state that you can use if you have to stop playing and aren't near a save point. Also you have the options of mapping the buttons to the Wii U gamepad as well which is handy too. 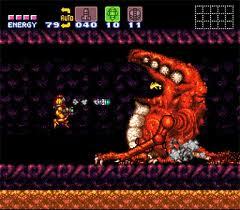 Super Metroid is a prime showcase of the 16 bit era. Its a great sci fi action adventure game with alot of exploration. If you have never played this game for whatever reason or like me didnt care for it during the 16 bit era its worth giving this game another chance. The atmosphere, story and boss battles really make this game shine. In an age where it seems most games from the 16 bit era don't age well, Super Metroid had indeed aged really well like a fine wine. With speed runs and different ending the replay value is high for this title. For a few more weeks this game will be offered for 30 cents on the Wii U VC but even paying full price you can't go wrong with this games. This is quite possibly Samus' greatest adventure. 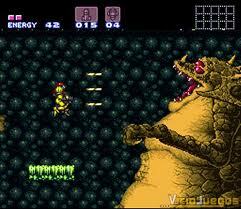 I still need to finish Super Metroid on the Wii Virtual Console. Anyways I added your review to the reviews page, added it to our featured reviews slide, and added some pics. Yeah I am just about done with it myself for the first time. I have a bit of exploration to do and I need to fight Ridley. I think I have sunk something like 13 hours into this game. Was that a PAL exclusive? I dont remember Super Metroid ever coming to the states bundled with a guide. In fact that only game I remember like that was Earthbound. Still that guide must have been very handy in 94. It probably may have been an exclusive, I found a image on the Internet of the box that the UK version of Super Metroid came in. This game was really hard to beat but it was a blast! @visicalc: Yeah that looks like a PAL copy. That is awesome though I bet it fetches a pretty good price on places like ebay. @Staroceancrazy: Yeah I will admit it did have some tough parts but for me it was more the jumping that gave me a hard time than anything else. Still haven't beat it though, I was hoping too this weekend but I was sick so I didnt play my games. Now that E3 is upon us I probably wont play it again till this weekend.